It is hardly news anymore to hear of an orchestra struggling to balance their budget. Atlanta musicians are locked out for the 2nd time in two years over contract negotiations - the musicians have been asked to take yet another pay cut. The Philadelphia Orchestra declared bankruptcy a couple of years ago. Colorado Symphony has been operating with a deficit for years. These are not isolated examples. A new technology pilot program offering up to 500 lawn patrons exclusive digital media content while listening to an All-Dvořák program led by BSO Music Director Designate Andris Nelsons On July 11, during an all-Dvořák BSO concert under the direction of BSO Music Director Designate Andris Nelsons, the Boston Symphony Orchestra will introduce the first-ever Tanglewood Lawncast, a unique, technology-enhanced lawn experience, offering participating patrons access to exclusive digital media content—program notes, performer interviews, and additional camera feeds—via their smartphones and tablets. The Tanglewood Lawncast pilot program will take place on a specifically designated area of the lawn outside of the Koussevitzky Music Shed, with space to accommodate up to 500 patrons with lawn tickets. Patrons interested in participating in the program can register at www.tanglewood.org/lawncast, with availability determined on a first-come, first-served basis. Why are people under 40 not in your concert hall? Symphonies are becoming increasingly aware that the average age of their patrons and ticket buyers are aging, with no real increase in getting a younger generation of symphony goers to replace them. Why??? It comes down to how we communicate with this younger generation. If your concert hall does not have people under the age of 35, it is because of the culture you have established. They do not feel comfortable in your hall and until they do, they have no desire to attend your concerts. This is, of course, a generalization, but overall, people under the age of 35 have a few things in common that we need to be aware of in order to effectively market to them. According to arts advocates like Louis Spisto, keeping arts education in schools is essential to the development of today’s students. Throughout his long career as a producer and arts executive, Spisto has led the development of community and education-based performing arts and theater programs designed to spread appreciation of the arts amongst youth. Unfortunately, in the era of school budget cuts, arts education is almost always one of the primary targets. Schools nationwide are trimming arts programs, and students are no longer learning to appreciate music, visual and performing arts. This is worrying to Louis Spisto and many others in the art community. “The argument for arts education is robust for so many reasons, regardless of how strict budgetary limitations become,” says Lou Spisto. While great performers and performances will always be central to why people attend live arts events, experts like Lou Spisto (with nearly three decades of experience in the arts world) believe that social media is becoming an important player for audience engagement and possible growth in overall attendance. Social media’s influence seems to be everywhere and the 2014 Academy Awards may be the boldest example of this to date. Ellen DeGeneres, the host of the show and already a top figure on Twitter, broke new ground with the “impromptu” tweet of her “selfie” that included some of the world’s most well-known celebrities. It generated more than 3 million retweets. She easily surpassed the previous record holder, President Obama, who had under a million. Denver – The Arapahoe Philharmonic presents “Classic Traditions” on Friday, March 14, 2014, at 7:30 p.m. with a program featuring Johannes Brahms’ lush Symphony No. 2 and Pyotr Ilyich Tchaikovsky’s Violin Concerto, one of the most popular and technical concertos for violin, with soloist Josiah Hamill, winner of the 2014 T. Gordon Parks Collegiate Concerto Competition sponsored by the orchestra. Maestro Devin Patrick Hughes conducts this fifth concert in the Philharmonic’s 60th Anniversary Season at Mission Hills Church, 620 SouthPark Drive, Littleton. Hughes and Charley Samson, Colorado Public Radio classical music host and Arapahoe Philharmonic emcee, will give a pre-concert talk at 6:45 p.m. discussing the program. Tickets are $25 (adults), $20 (seniors), and $5 (students/children) and are available online at www.arapahoe-phil.org, by phone at 303-781-1892 or at the door. Jacaranda's 10th anniversary season continues on Saturday, February 22, 2014 with a dinner break — a break that separates the performances of two 20-movement mid-twentieth-century masterworks by John Cage and Olivier Messiaen. Each cycle is played by an American pianist with whom the music has become synonymous: Adam Tendler and Christopher Taylor, respectively. The consecutive concerts (Tendler at 5:00 p.m. and Taylor at 7:30 p.m.) will take place at First Presbyterian Church of Santa Monica, 1220 Second Street, Santa Monica, CA 90401. As a highlight of its 40th anniversary season,Kronos Quartettakes the stage in Carnegie Hall’s fabled Stern Auditorium onFriday, March 28 at 8 pm. The one-night-only concert features a world premiere byTerry Riley, and boasts a stellar array of guest artists.ComposerBryce Dessnerof The National will play electric guitar onAheym, the title piece from his acclaimed new Anti- CD of works written for Kronos. Pipa virtuosoWu Man, a frequent partner, will be heard in the New York premiere ofPhilip Glass’sOrion: China. Protean indie-rock composerJherek Bischoffjoins in on electric bass forA Semiperfect Number, which he premiered with Kronos last July at Lincoln Center Out of Doors. 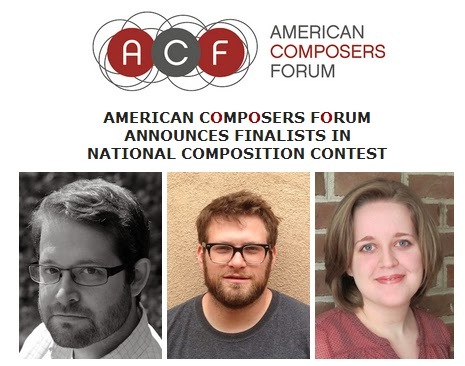 In partnership with the acclaimed new music ensemble So Percussion, the American Composers Forum is pleased to announce the finalists in the 2014 American Composers Forum National Composition Contest: Michael Laurello (Yale School of Music), Todd Lerew (CalArts), and Kristina Warren (University of Virginia). Each finalist will receive a cash prize and be asked to compose an eight- to ten-minute piece for So Percussion. The resulting pieces will be workshopped with the finalists in residence, and premiered by So Percussion on July 20 at Princeton University, as part of the So Percussion Summer Institute 2014. One of the works will be chosen to receive the final prize, which includes an additional cash award and future public performances by So Percussion. Boston, MA – Jan. 16, 2013 – Delighted to hear of the Oscar nomination of Morgan Neville’s documentary 20 Feet from Stardom, world-renowned cellist Yo-Yo Ma said: “What I love most about 20 Feet from Stardom is how deeply Morgan Neville examined the preconditions of creativity. He showed us how the giants stand on the shoulders of the artists whose stories he told." Morgan Neville is currently directing The Sound of Silk, a documentary about the musicians in the Silk Road Ensemble. Brought together by the Silk Road Project, which was founded in 1998 under the artistic direction of Ma, the Ensemble has featured members from more than 20 countries, performed in 119 cities in 30 countries, generated more than 80 new works, recorded 60 pieces of music, and just released its fifth CD, A Playlist Without Borders. MINNEAPOLIS, MN (January 17, 2014)—The Minnesota Orchestra today announced plans for two weeks of homecoming concerts February 7 through 15, offering audiences the first chance to hear the ensemble perform in the renovated Orchestra Hall. The Orchestra’s return begins February 7 and 8 with a pair of historic concerts led by the ensemble’s eminent Conductor Laureate Stanislaw Skrowaczewski, highlighted by Beethoven’s heroic Third Symphony and Skrowaczewski’s own powerful orchestration of Bach’s D-minor Toccata and Fugue—the work that opened the first concert at Orchestra Hall in 1974. French conductor Yan Pascal Tortelier continues the musical homecoming February 14 and 15 with a set of Valentine’s weekend concerts that includes an all-British program of Holst’s popular The Planets and Elgar’s Cello Concerto, the latter featuring virtuoso soloist Steven Isserlis.